Did you know that ice cream cone history includes items such as penny lickers, cornets, zalabias, and cornucopias? Did you know that New York City, St. Louis, and London all witnessed the invention of today's most famous edible container? Let's take a peek below at the surprising facts. What do ice cream cones have to do with New York's Wall Street? Well, at the end of the nineteenth century, a pushcart ice cream vendor on Wall Street named Italo Marchiony looked for an easier and more practical way to sell his lemon ice cream to customers without the bother of having to use the bothersome glass penny licks that were in common use. Not only did the small, shallow glasses called penny lickers have to be returned and wiped clean, but also customers sometimes dropped them or simply walked off with them. And some customers rightly refused them for sanitary reasons, as most Hokey-Pokey vendors simply gave them a brisk wipe with a well-used rag before dropping a small ball of ice cream on them for the next customer to lick. In a stroke of sheer genius Marchiony baked a crisp, cup-like pastry with sloping sides and a flat bottom to use as a walk-away container. The edible cup was a tremendous hit with his customers, and he filed a U.S. patent for it in September 1903 claiming he had been making the edible cups since 1896. Industry has since voted the edible pastry cup an example of an environmentally perfect container. A Syrian pastry vendor from Damascus named Ernest A. Hamwi is credited with creating the first "waffle-type" ice cream cone at the St. Louis World's Fair in 1909. He ingeniously rolled a thin, crispy, waffle-like Persian pastry called zalabia into a handy cone-shaped holder for a scoop of ice cream after a nearby ice cream vendor — some say it was Charles E. Menches — ran out of glass penny licks. After the fair, Hamwi and his financial backers successfully opened the Cornucopia Waffle Company and later the Missouri Cone Company. However, Hamwi was not the only one to claim the invention. 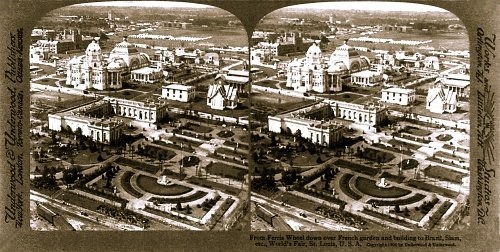 Charles E. Menches, Abe Doumar, David Avayou, Arnold Fornachow, and Albert and Nick Kabbaz all claimed ownership and they were all vendors at same World's Fair. Despite who invented it first, the popularity of the "World's Fair Cornucopia" spread quickly worldwide and the rolled, crispy waffle cone is still popular today and firmly rooted in the history books. America's Marchiony might have invented a flat-bottomed edible cup, but he did not invent the first edible ice cream cone or cornet, as the British like to call them; evidence of an earlier edible container has surfaced. In 1888, Agnus Bertha Marshall (1855–1905) published "Mrs. A. B. Marshall's Book of Cookery" in London, England, which made a very clear reference to custard cones in her recipe "Cornets with Cream." All told Mrs. Marshall wrote four popular cookbooks, including two on the subject of ice cream making: "The Book of Ices" in 1885 and "Fancy Ices" in 1894. Both books contain a recipe for cornets or "comet casings" made of flour, sugar, eggs, vanilla, ground almonds, and rose water. Marshall's books also featured recipes for exotic ices such as Parisian Cucumber Cream, Brown Bread Soufflé, Gooseberry Sorbet, Monte Carlo Violet Ice, and Battenburg Ice. It always surprises people to learn that despite the many flavors advertised by today's ice cream manufacturers, there are really very few new flavors under the sun! Mrs. Marshall lectured extensively on cookery and became quite well known throughout the United Kingdom. She eventually founded her own successful cooking school called the Mortimer Street School of Cookery, and she patented and sold her own cooking equipment and a variety of decorative ice cream molds which are now valuable collectibles. It's not generally known that she also patented an ice cream freezer with a unique design. It was wider and shallower than the American Johnson-type freezer and was thought to produce a better churned and much creamier ice cream. Mrs. Marshall's popular cookbooks with their exotic ice cream recipes and ice cream cone recipe served to create a huge demand for elegant ice cream desserts during the late-Victorian era. But, she earned her place in ice cream cone history with her famous custard cones. It's easy. Select an old fashioned ice cream cone recipe from Grandma's recipe collection and learn how to make your own wafer cones. 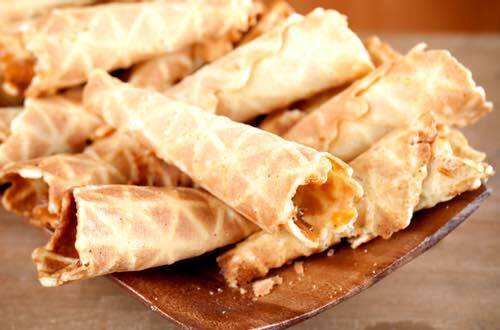 These crispy, melt-in-your-mouth cones are perfect for serving your homemade ice creams in. Experiment with these old fashioned recipes and you could make ice cream cone history right in your very own kitchen.